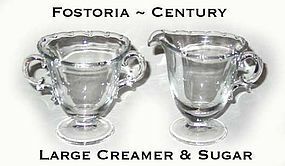 Fostoria Century Large Creamer and Sugar ~ Nice! This is the largest size creamer and sugar in the Century pattern by Fostoria. Excellent condition!